Over the summer we had a water leak in the Alligator Bender pool. In order to fix the leak, the pool had to be drained while the repairs happened. While the pool was empty, the Horticulture staff took the opportunity to hop in and remove all the undesirable plants we could. 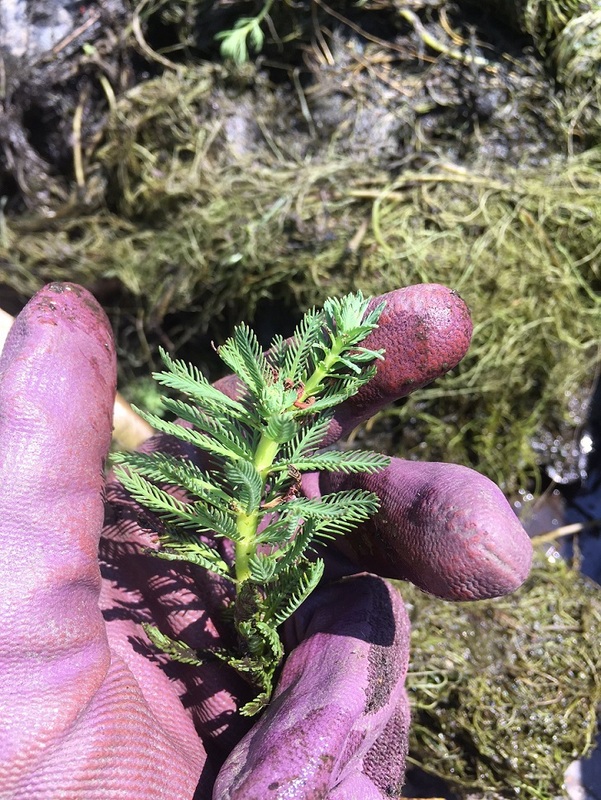 Our biggest weed problem was Parrot Feather (Myriophyllum aquaticum) that had spread throughout the pool, along with some sprinklings of Nutsedge. Needless to say, we had not totally eradicated all of the weeds and more came back over the following months. We devised a plan and figured out our next management step. That brings us to present day. 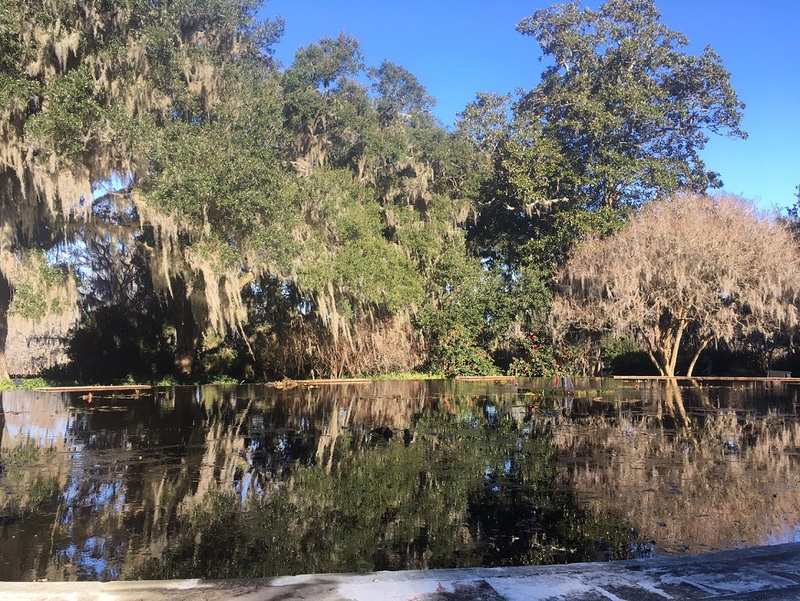 The pool where Alligator Bender sits is a deep pool, not easily entered in waders. Our alternative? Kayaks! 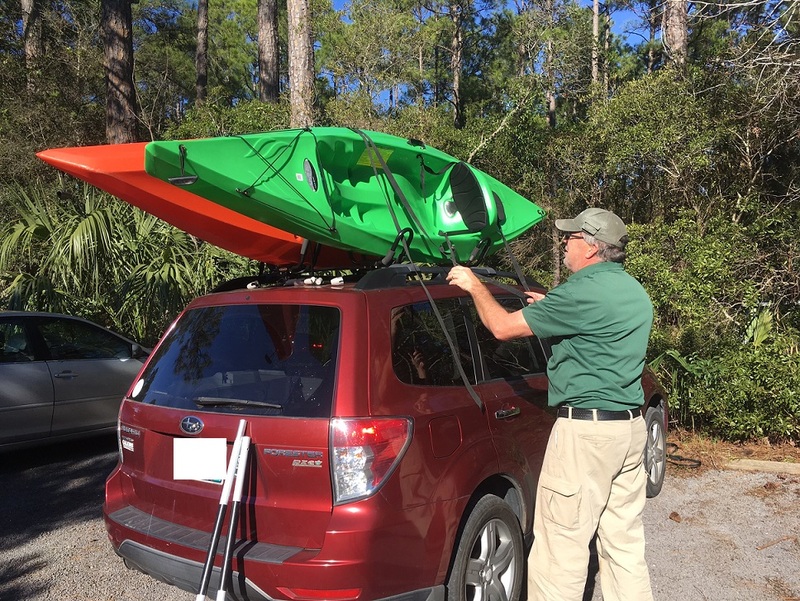 Frank, one of our Horticulturists, who has graced this blog many times before, graciously lent us his kayaks to undertake the task. 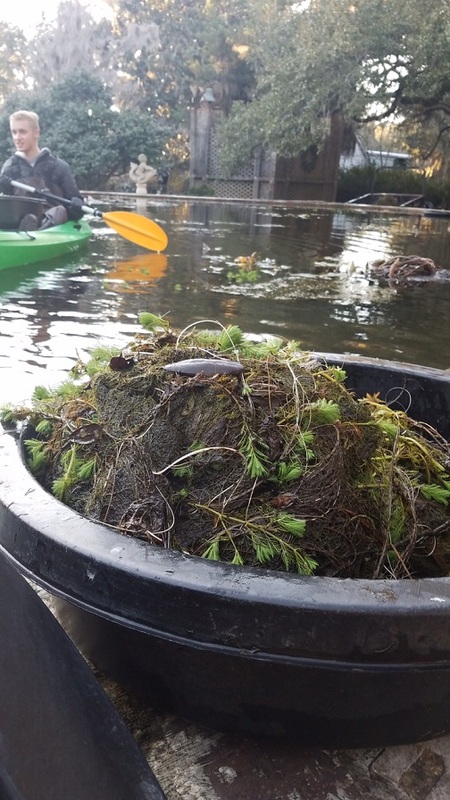 The plan was a team of two would get in the water, kayak to the weeds that would be collected in buckets on our laps, and pass them to our ground (or terrestrial) support team to empty. (Not so) bright and early! Frank brought his kayaks in for our use. We helped free them from the car and loaded them up in our work vehicles to transport them to the site. But not so fast. This was going to be messy work. 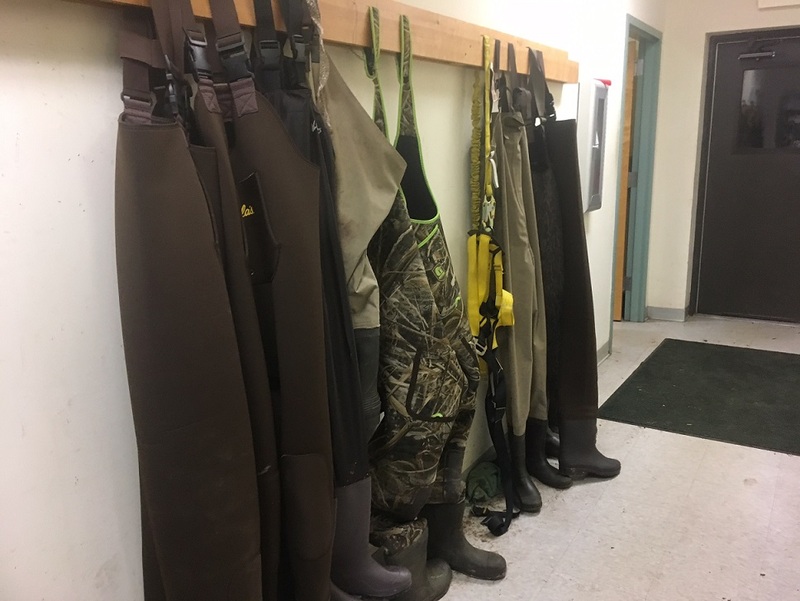 We loaded up two pairs of waders to wear while in the kayak. The water was going to be cold, and surely there would be splashing, and not just from my flailing while trying to remain balanced and in the vessel. FYI – if you’re new to kayaking, don’t flail, it just makes you more prone to throwing off the needle-thin balance you’re probably barely maintaining. Supplies in hand, we headed out to Alligator Bender. 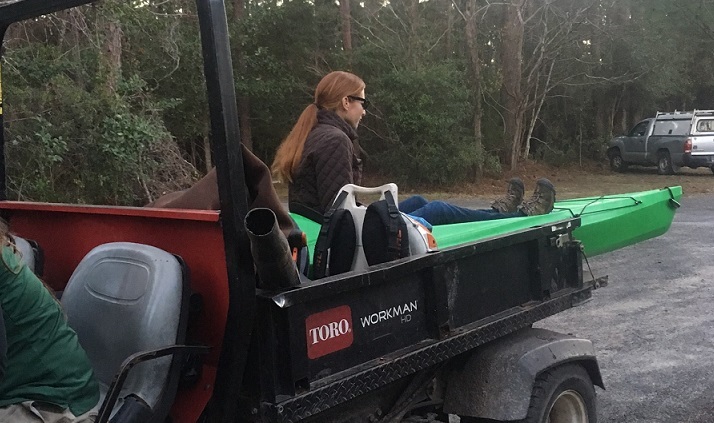 Katherine, our Director Horticulture, came along for the ride and helped keep the kayak from going anywhere during our brief commute to the gardens. Once we reached Bender, it was time to unload, and of course, take a “before” picture. As you can see above, there is a variety of plant life in the pool. For the most part, we want Alligator Bender to be filled with water lilies (Nymphaea). Everything else was undesired for the location and thus considered a weed. It was time. Alligator Bender clean out, part two, was about to begin. 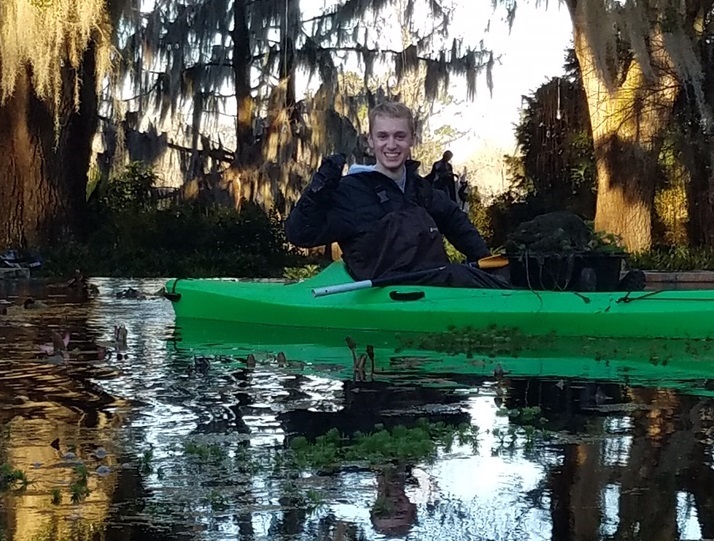 Brendan, our intern, and I got in the kayaks and got to weeding. Although we were both kayak novices, we got to work carefully removing the Parrot Feather, and any other undesired plants. Brendan quickly became adept at maneuvering and managing his kayak. I did not. As we worked to clean the pool, our buckets were filling fast. And in my case, so was my kayak. Once our buckets were at capacity, we traveled to our ground support, in this case Gina, another member of the Horticulture staff. 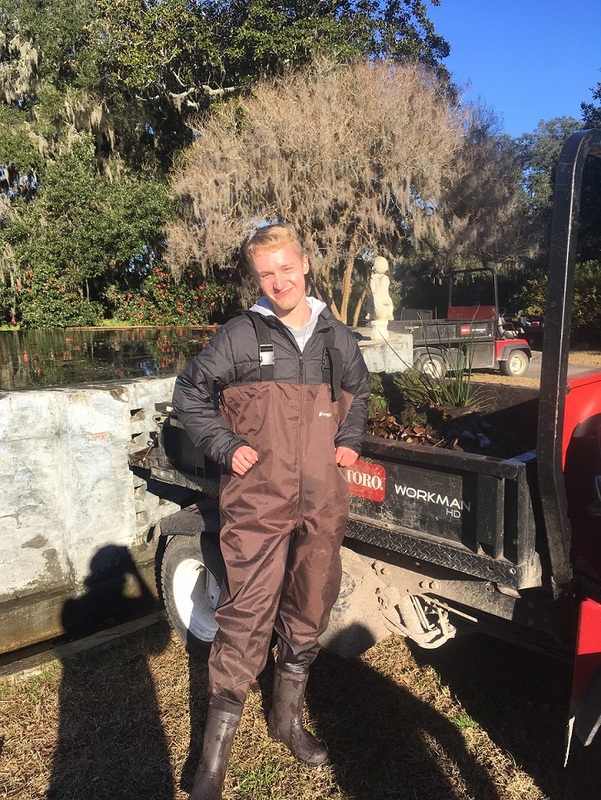 She, along with Frank, helped lift the buckets heavy with weeds, saturated roots, and of course water, out of the kayak and into the back of the work vehicle. After a few hours, we had cleaned as much of Alligator Bender as we could. The cart full of weeds was a satisfying sight. Alligator Bender had received its makeover. 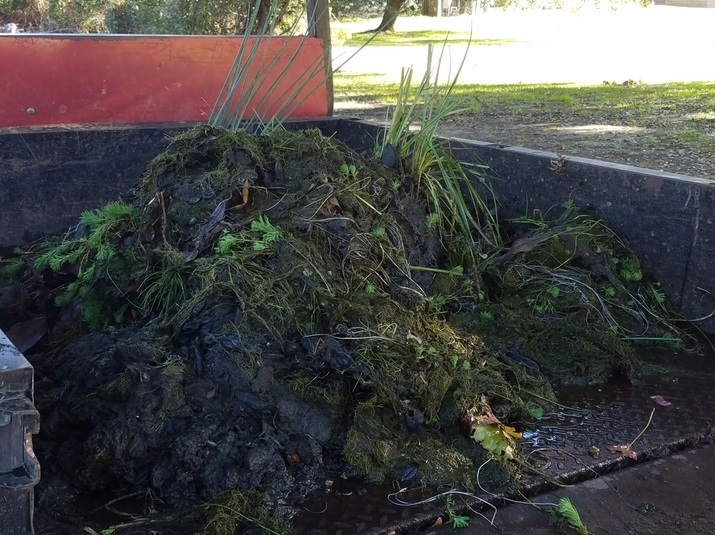 As you can see from our “after” picture above, a lot of weeds were removed and more water was visible. With more space in the pool, the water lilies will hopefully continue to extend their reach. As we move into the warmer months, this will begin to occur. 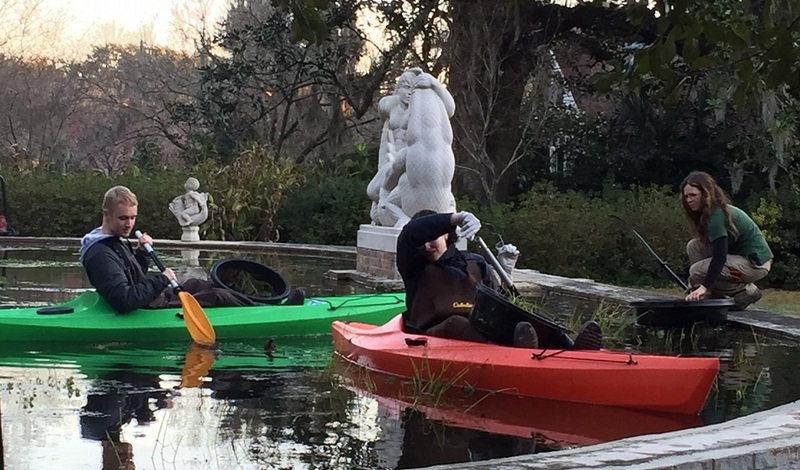 After abandoning the waders for more comfortable attire, we cleaned off the kayaks of what can best be described as muck. An exciting, and fun, job was now behind us. 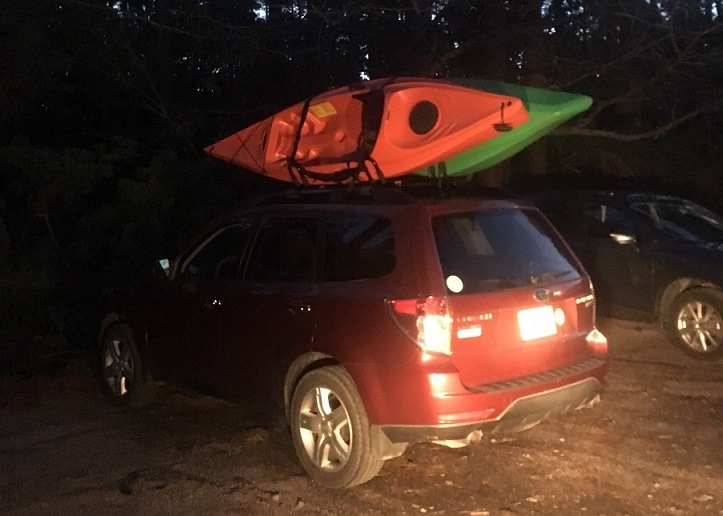 The only thing left to do was to secure the kayaks back on to Frank’s car. Never a dull moment! 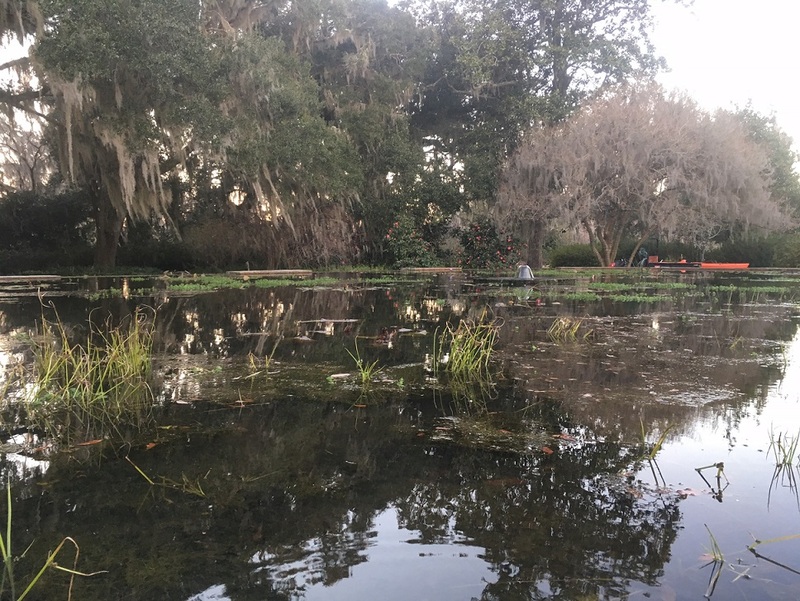 Having such a dedicated staff who are ready for anything is definitely a big help in not only accomplishing what may be considered some oddball tasks, but also in keeping Brookgreen as beautiful as it is today.